Potion Purple Aulani Gear and Other New DVC Merchandise - DVCNews.com - The essential Disney Vacation Club resource! 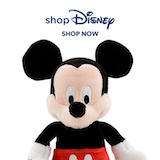 ShopDisney has a few new items which may interest fans of Disney Vacation Club or its Hawai'ian destination Aulani, a Disney Resort & Spa. Potion Purple is the new thing for 2019 and shopDisney has launched a wide product line around the hue. Among the items is the Aulani Spirit Jersey. Other recent additions to the Aulani collection include a pink jersey, new mug and towel designs and a Tori Richard fashion line with matching tops for the entire family, like the womens' tank depicted below. Recent additions to the Disney Vacation Club collection include a pin set and bath robe. Item photos and ordering links can be found below. Disclosure: DVCNews.com may receive compensation for products ordered via affiliate links. These links do not impact the amount paid by the consumer. Aside from affiliate links and ad networks (like Google Adsense), DVCNews.com does not receive any direct compensation--financial or otherwise--from Disney Vacation Club, Disney Store or any other Disney entity. We gratefully thank you for your support!